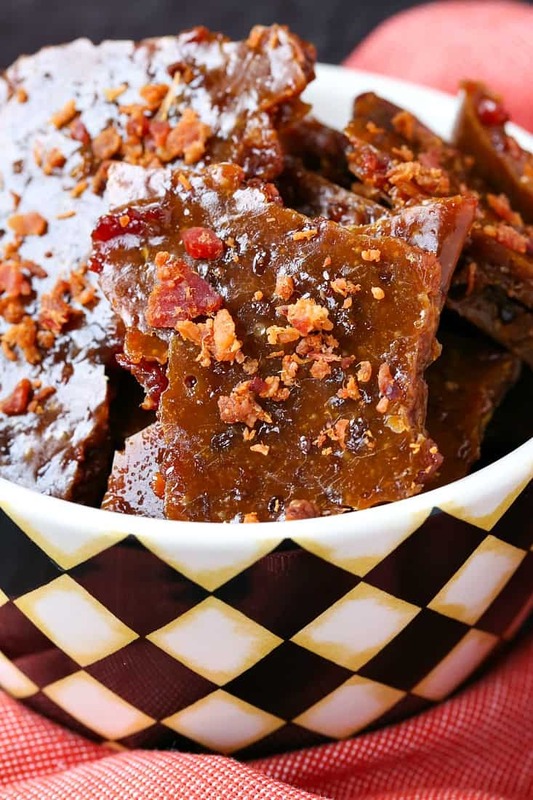 Easy Bourbon Bacon Brittle is a chewy and crunchy brittle recipe all at the same time! 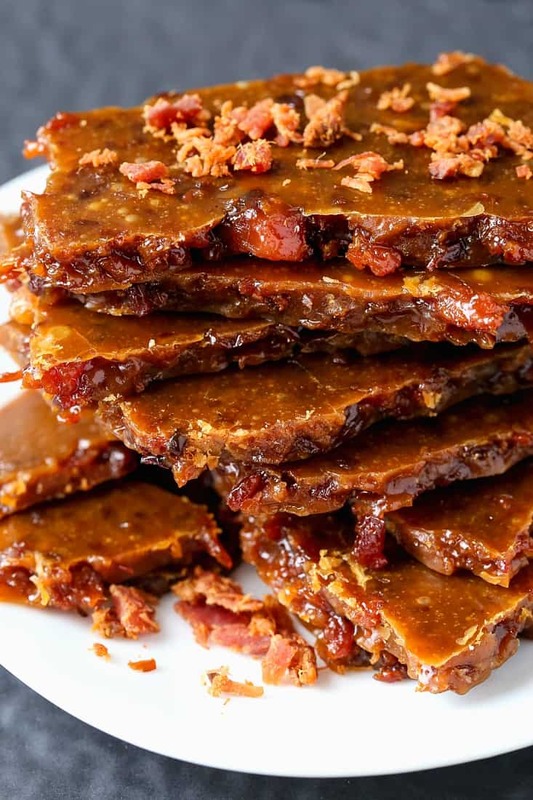 Sweet brittle and salty bacon make the perfect flavor combination! 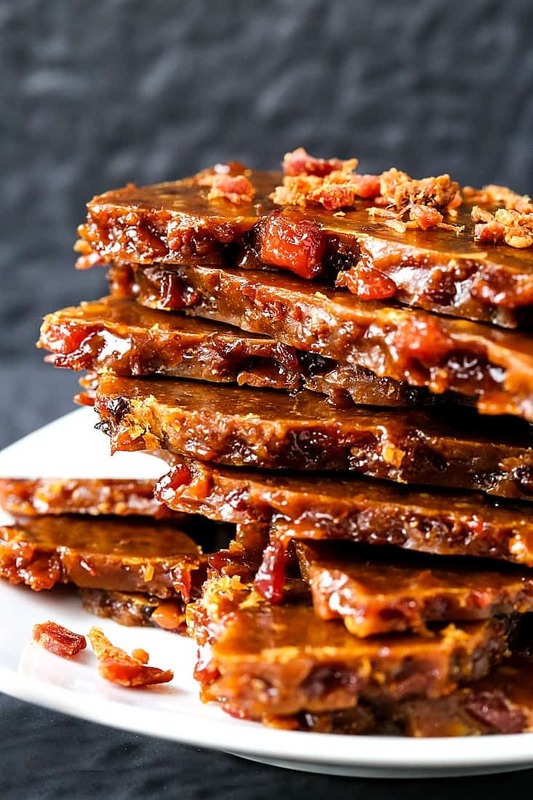 We’re kicking off Dessert Week with this Easy Bourbon Bacon Brittle! as a holiday gift or hostess gift! We’re getting in it. The holiday season has arrived and I couldn’t be more excited. Besides summer this is my favorite time of the year. Everyone seems to be in a great mood, feeling generous and in constant. party mode. Well if you’re a friend of mine you know I’m always in party mode – but even more so during the holidays. 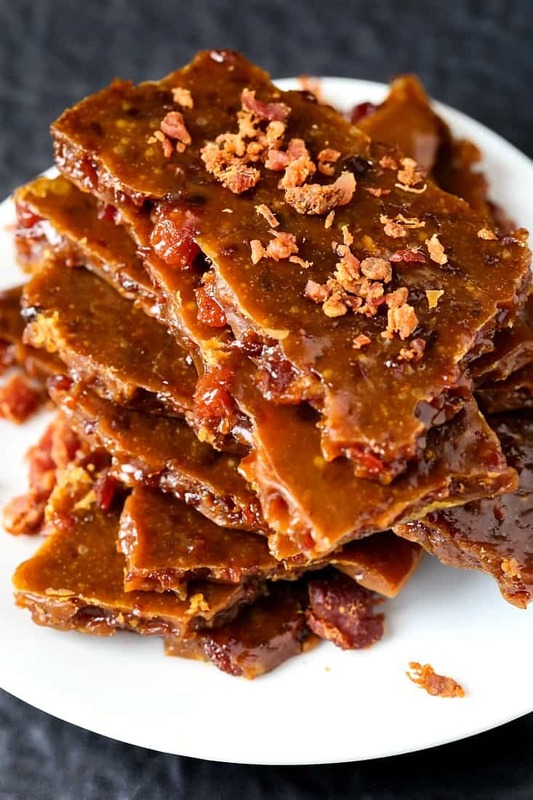 One of the things I like to do most is give presents that have some real thought behind it or even something homemade like this Easy Bourbon Bacon Brittle. Sure you can go ahead and grab a candle to bring to your friends’ Christmas party but I guarantee 15 minutes in the kitchen making this delicious brittle recipe and you’ll be on the top of the party list. This easy brittle recipe is literally one of the easiest things I’ve ever made for dessert, too. just like the name says…easy. From start to finish this brittle is on a sheet pan and cooling in just about 15 minutes. You do have to let it cool for about an hour before you crack it up but I know you’ve got other things to fill your time while you wait. 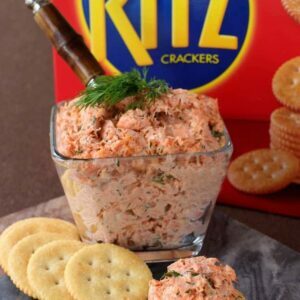 What Can You Add To Brittle? There’s a lot of different flavors that you can add to a basic brittle recipe. You can add alcohol, leave out the alcohol, switch out the bacon for – wait. No. You can not switch out the bacon. How Do You Make Brittle? 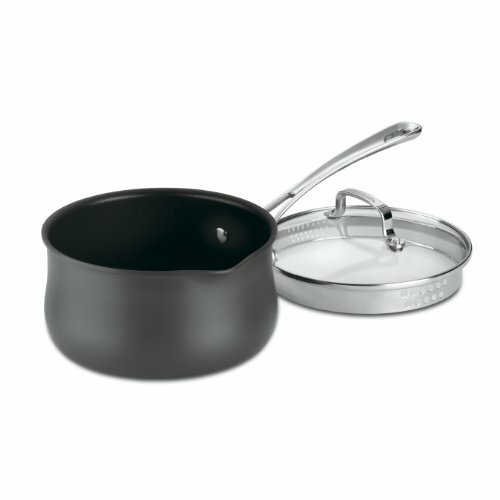 Start out by melting butter in a heavy bottomed pot. Once the butter is melted add in brown sugar and maple syrup. For a recipe like this brittle where you’re only using a few ingredients you want to make sure they’re all top quality. So no pancake syrup here, use a real maple syrup to get the best flavor. 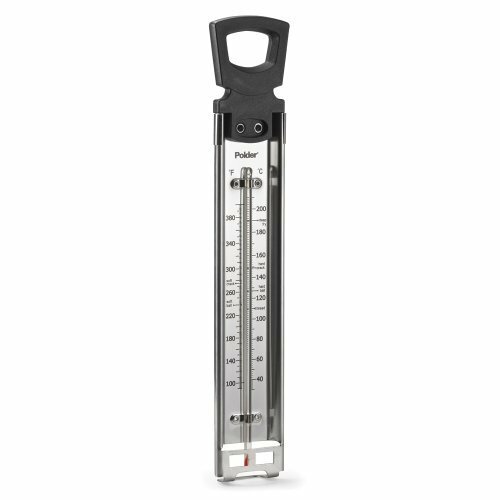 You’re going to need a candy thermometer, they aren’t that expensive at all and if you buy one like I have that doubles as a fry thermometer you’re good to go. Boil the butter and sugar mixture until it reaches 300 degrees, watch this carefully because it’ll be bubbling away at 200 and something and then all of the sudden it’ll be ready. Now turn the heat off and add baking soda carefully, the mixture will bubble up so you have to add it and then start stirring. 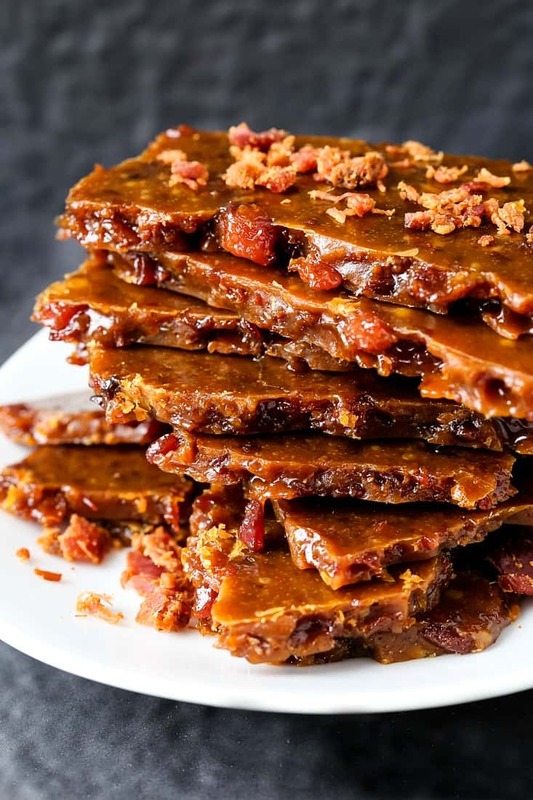 So at this point you can add the bourbon, for this Easy Bourbon Bacon Brittle, and again, stir quickly because it will bubble up. Once the bourbon is in pour the mixture out onto a baking sheet that’s been sprayed with cooking spray. Have all your add-ins ready because you need to get them on while the brittle is still hot so it sticks. 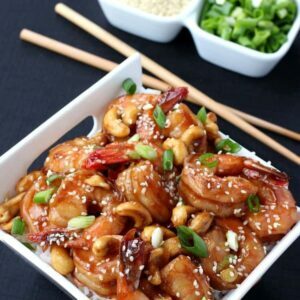 Here’s where you can add the bacon as in this brittle recipe, or chopped nuts or raisins or any of your brittle add-ins that you like. Let the brittle cool and harden for about an hour and then you can start breaking it apart into pieces. 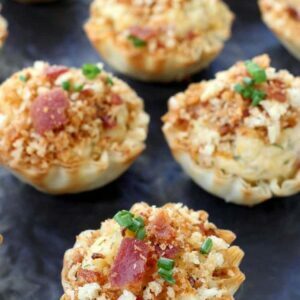 Add this bacon brittle to a bowl and place it out for guests to snack on, wrap it up in decorative paper or a pretty container to give as a gift – or just eat it. 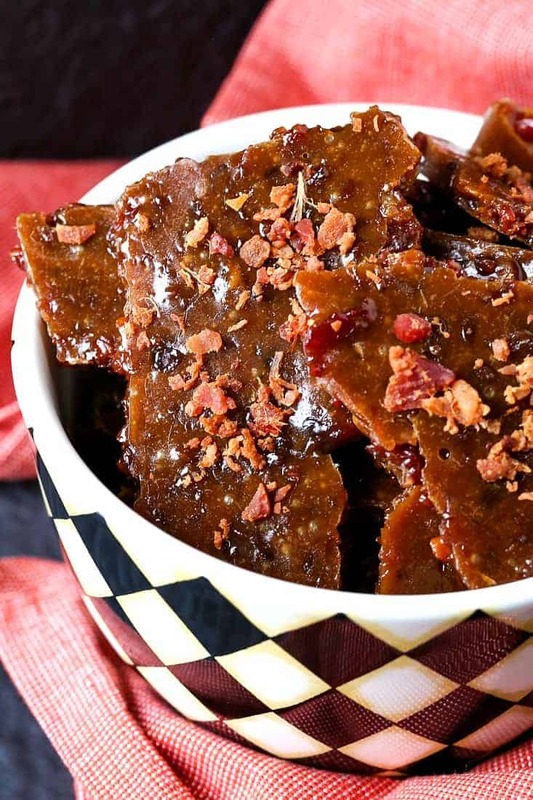 This Easy Bourbon Bacon Brittle isn’t just for the holidays either! Think Father’s Day or Easter baskets or really anytime you want to give a homemade gift to someone! 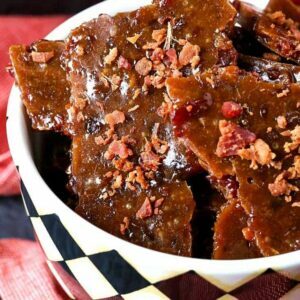 This delicious bacon brittle recipe is perfect for giving as a hostess gift during the holidays or any gift giving occasion! Add the butter to a 2 quart, heavy bottomed pot over medium heat. Once the butter has melted, stir in the brown sugar and maple syrup. Bring this mixture to a boil, then let simmer for 10-15 minutes until a candy thermometer reads 300 degrees. Once the mixture is at 300 degrees, turn the heat off and carefully add the baking powder and stir. The misture will bubble up when you add the baking powder so stir quickly. Next add the bourbon and stir quickly again. Pour onto the sprayed baking sheet and spread out into and even layer that’s about 1/4 inch thick. Add the bacon bits to the top of the brittle while it’s still warm. Let the brittle cool for about an hour, then break it apart into pieces.